You can easily impress the guests at your next party — just serve fancy homemade delicatessen-style pinwheel sandwiches as part of the appetizer assortment. Make enough pinwheels for an average of at least three to four pinwheels per guest. 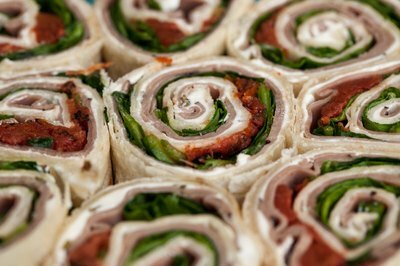 Deli pinwheels can be quickly prepared, can be made the morning of the party and require no cooking expertise. Deli pinwheels are colorful and interesting in appearance, especially when several different varieties are prepared and placed on the same serving platter. Sanitize the work surface and all utensils that will be used by washing them in a solution of one part bleach per nine parts water. Wash your hands thoroughly and use disposable plastic gloves if available. Pinwheels are not cooked after preparation, and measures must take place to protect your party guests from food-borne illness. Assemble the ingredients and utensils at the work station. All packages should be open and ready to use to prevent any more contact with unsanitized surfaces than necessary. Place the four tortillas on the work surface. 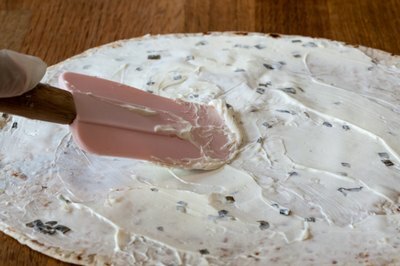 Use a cake knife or spatula to spread the herb-flavored cream cheese evenly over each of the tortillas all the way to the edge. Lay the thinly sliced roast beef on top of the cream cheese, making certain to leave a 1/2-inch border around the edge of each tortilla. 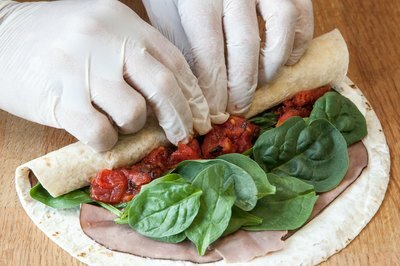 Arrange the spinach leaves over the top of the roast beef, completely covering it and leaving the 1/2-inch border around the edge of each tortilla. 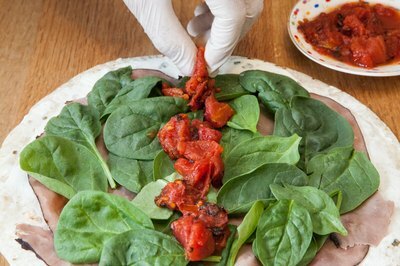 Place sun-dried tomatoes down the center of each tortilla on top of spinach leaves. If you are using tomatoes that have been packed in oil, thoroughly dry them with paper towels before using them. 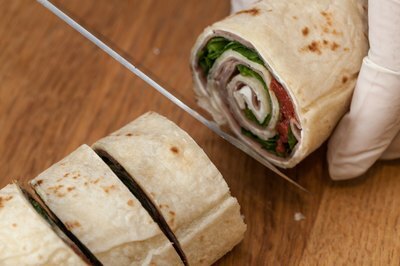 Roll the tortillas tightly like a jellyroll. Tightly wrap the rolled tortillas individually in cling wrap and refrigerate for six to eight hours. Remove the cling wrap from the pinwheel and slice each tortilla into 10 1-inch sections. The ends of the tortilla will not be as full as the rest of the pinwheel; these can be discarded. Arrange on a serving tray and serve to approximately eight guests. 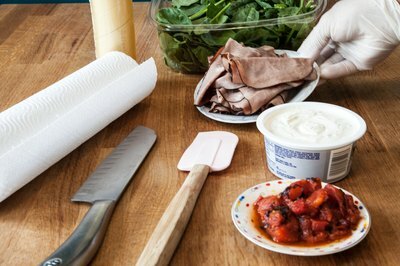 The preparation time for four deli pinwheels is approximately 20 minutes. Make deli pinwheels with turkey, ham or your favorite deli meat instead of roast beef. Use sliced or shredded cheese as an additional ingredient. Spread the ingredients evenly to within 1/2 inch of the edge of each tortilla so you do not end up with several inches of unusable sandwich. 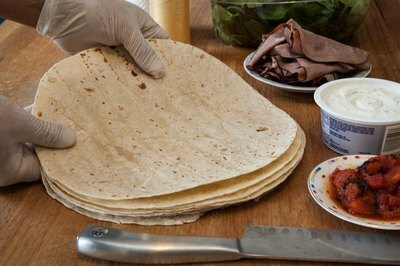 Assemble all the ingredients in the tortillas and return them to the refrigerator immediately after wrapping. How Much Deli Meat Should Be Bought for Sandwiches?